Click here to see the before and after graphic of the Newport Jazz Festival. Changes in musical style and curatorial direction are only part of the Newport Jazz Festival story. Whether the band on stage was old or new, traditional or avant-garde, there’s been one constant since the open-air festival’s inception in 1954: the weather. Over nearly two decades of going to Newport, I’ve experienced all kinds of weather — from muggy Friday nights at the Newport Casino to the sun-blasted or rain-drenched Saturdays and Sundays on the open peninsula of Fort Adams State Park. 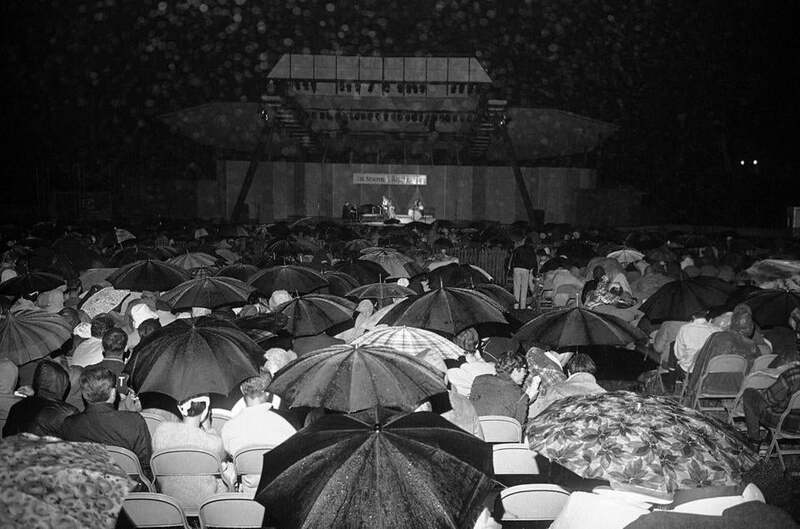 One year the rain was blowing hard and the PA system crackling as Wayne Shorter and the Miles Davis tribute band roared through their set and a couple of hundred audience members stood huddled in ponchos, towels, or tarps. Years later, dreamy free improvisations between Shorter and pianist Herbie Hancock were part of a hot, windless afternoon — the span of the Newport Bridge, the sailboats dotting the harbor, the quiet, attentive crowd. More recently, in the Fort’s small, tent-covered infield stage, singers Theo Bleckmann and Kate McGarry sang as rain poured off the roof behind them. They were singing with John Hollenbeck’s Large Ensemble, and it was crowded up there, and crowded in the audience. But somehow the elements enhanced the intimacy of the music. At one of those evening Casino shows, the air was so damp — threatening rain that never arrived — that each note played by the Wynton Marsalis Quintet seemed to hang in the air, perfectly sculpted, right down to the bright ping on the drummer’s ride cymbal. Maybe the band had a particularly good sound mix, or they were just playing particularly well. Or maybe it was the weather.